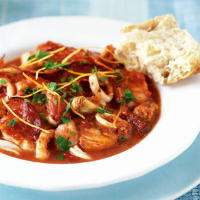 A simple tomato sauce with shellfish and fresh cod, topped with crispy, spicy chorizo slices, lemon zest and parsley. Cut the cod fillet into large pieces (about 5cm wide). Place the fruits de mer in a colander to remove the excess water, then pat dry with kitchen paper. In a large saucepan, gently warm the chopped tomatoes until simmering. Heat a large frying pan, add 1 tablespoon of the tomato oil and fry the cod for 3 minutes, turning once until it begins to go a golden colour. Remove from the pan and set aside. Add another tablespoon of the oil to the pan and fry the fruits de mer over a high heat for 2 minutes, or until the prawns have started to turn pink. Remove from the pan and wipe out with kitchen paper. Add the cod to the tomato sauce and gently stir in the fruits de mer and the sundried tomatoes. Simmer for 5 minutes until the cod is just cooked through and starting to flake but not break up. Heat the frying pan over a high heat, add the remaining oil and fry the chorizo until crisp. Drain on kitchen paper then roughly chop and scatter over the finished stew. Sprinkle with the lemon zest and parsley and serve immediately with hot Waitrose White Rustic Rolls. Instead of the chopped tomatoes, use a fuller-bodied, gutsy tomato sauce, such as puttanesca, for added depth of flavour. Serve with a fruity but dry southern French rosé, such as Château de Caraguilhes Rosé 2004 Corbières, made from organically grown grapes.